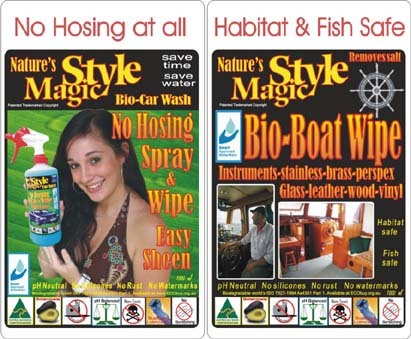 Car Wash. Natures Style Magic (biopower 2010) No Hosing vehicle Spray Wipe wash & sheen protectants – Botanical solutions for detailers, fleet managers, dealerships, car rentals & demanding private users. Hydro-cellular products. Naturally clean & protect your car. 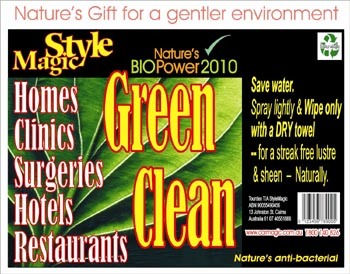 Now, you can be green and still be clean! – world’s first and ONLY, botanic/organic and water based ‘waterless’ whole of car and alloy wheels wash.
– world’s ONLY, that ALSO cleans your vehicles’ leather seats, steering wheel, vinyls, satnav screens, glass, carbon fibre, etc. Used for cleans & sheens on Cars-Boats-Helicopters-Buses-Planes-Motorbikes in daily use, or on those in showrooms or exhibitions ! Want a Sheen on your whole car ? 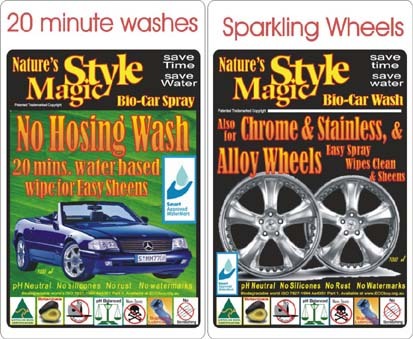 Just wash it with StyleMagic. Wash car. Dry wash. All natural. reduce car polishing. A deserving, ETHICAL product that saves labour costs, and also the environment. Smartwatermark Approved, and at ECO-Buy (ECO-Find). Item 1 – Magic Spray & Wipe has the correct natural lubricants mixed with the right amount of treated water so it becomes a Spray n Wipe just like you do with your glass and kitchen surfaces. Child SAFE, pet SAFE, User safe, observer safe. So green, organic and safe, it has earned a lasting reputation of being drinkable ! , as we do really drink it during our washing demonstrations, but we certainly do not sell it as a drink. OFFSETTING YOUR FAMILYS CARBON EMISSIONS STARTS HERE – from your car and your home !!! You owe yourself, your family and the environment, to use it. 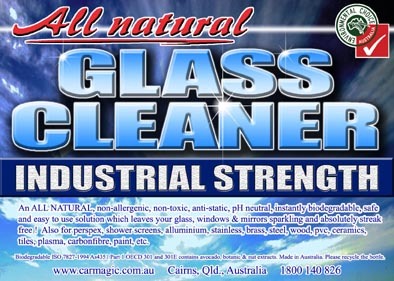 From AU $4.90 (per Litre=4 to 8 washes) it is cheaper than your earth damaging car wash concentrate, but with our product you are even further ahead, adding the man hours saved, the water saved and the environment saved, as it is the worlds first and ONLY pH neutral and non petro-chemical car detailing wash product. Item 2 – Our natures luxury GREEN CLEAN uses less water, and provides a luxurious and gentle wash with a streak free sheen, that only mother nature can provide. The sheen protects the waxes and paint on your possessions. Designed for clinics, surgeries, gyms, and homes. it is antibacterial too. It has a pleasant aroma. Item 3 – SPARKLE is for Extra Gleam on windows and glass. Item 4 – Our Best perforated superior IEnka filled chamois at $15 & $20 for the large size-cheapest in Australia. Visit our CAIRNS ONLINE STORE to order or look for us in an increasing number of stores. LONG TERM – In eight and a half years of continous use, we found that the wax shines lasts longer, less swirl marks, no scratches, much less mechanical & electronic problems, & almost stopping further rusting, if present. Fiurthermore, no cracking of leathers and vinyl fittings in the cars. REASONS – pH Neutral means no cutting of ANY protective applications everytime you wash. No cutting into your applied waxed paint work. No hosing means no water penetration into wires, hydraulic fluids, and body panels. All vinyl dash, leather seats were not stripped of their protectants. Higher than normal, more powerful than normal, natural lubricants protects the waxes and paintwork, making further car washes EASIER AND EASIER ! The Cairns Online Shop also has our full range of car care products including Water Stain Remover, Leather Care, Vinyl Care (smells like leather), Tyre Dye (3 months black) etc. Other unique car products are being added, plz check. Local warrantee, National Company, International Product. Quote from GT magazine .. WEB WATCHITS MAGIC If you go by the premise that the less time you spend cleaning a car the more time you will have to drive it, then the curiously-named Magic for Cars and Porsches could be for you. 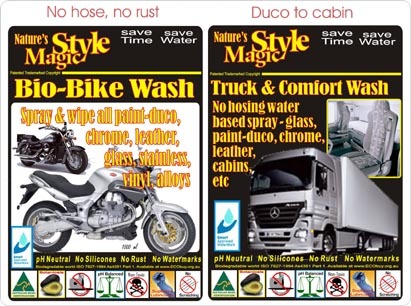 Designed in Cairns, Australia, Magic boasts being the worlds first and only ph neutral, non-petroleum waterless spray for vehicle exteriors and interiors. Given that hose pipe bans have already been introduced in some parts of the UK, a waterless car cleaner could be just the job for keeping your Porsche spotless this summer. Working on the premise that water itself doesnt wash cars, but the shampoo that it is mixed with, Magic puts both of these ingredients into one product; simply spray it on to paintwork, wipe with a damp chamois and your car is clean. Other car magazine write-ups and advertising in BMW & Excellence. True stories 2 Australian Professional ( & franchised ! ) detailers with between 5 to 6 staff each, were struggling to complete their workloads, let alone increase their business. Without any additional staff, they have almost doubled their business in just 6 months ! I met one of these men and introduced Style Magic No Hosing Spray when they were struggling. I am really pleased on three accounts; – that I had helped their business and even more importantly, that they were as pleased as I am, to be able to save so much water on top of all the time saved. In particular, they were thankful with regards to Health & Safety for their health, as the spray is absolutely non-toxic. Their business names and techniques are withheld due to agreements. If anyone is interested in a beneficial 2 way agreement type of arrangement with us, where certain training on some techniques we have now developed, drop us a line. Suitable to current detailers, and up & coming businesses. No time wasters please. This entry was posted in Uncategorized on 11/01/2018 by Charles Liew.